The Starbucks Incident has been an incredible thing to watch. Not only does it highlight the power of misinformation, social media, emotion and race but the leadership styles of all involved have proven what I have been saying as my role within the Courageous Leadership Institute. Last Thursday, two men walked into a Starbucks in Philadelphia and asked to use the bathroom. The manager told them that the use was for customers only at which time the subjects sat at a table. At one point, the manager advised them that occupying the restaurant (which was quite busy at the time) was for customers. They could purchase an item and stay. The men refused and when the manager told them she would have to call the police they advised her to call the police. This is the point in the story that patrons began to take video and become upset because according to them, these men did nothing wrong. Except of course refuse to leave and follow the simple instructions of a Starbucks Manager and Philadelphia Police Officers and commit the crime of trespassing, that is a law in every city in America. The men are arrested, handcuffed and taken to a police precinct. Starbucks then refused to prosecute and they were released. Within 24 hours, the partial video of the incident made international news with story after story saying these men were only arrested because they were black. “This is what it is like to shop and be black in America” lamented one article. Law Enforcement has been here many times. A partial video is recorded, the story is told by someone that knows nothing about the incident and racism is screamed from the rooftops. And that is exactly what was happening here. As the story broke last weekend, the anger and hostility was directed towards the Philadelphia Police Department. “Racial Profiling”, “Biased Policing” and just about any other buzz word out there was being thrown at the agency. In the past, it would continue and agency leadership would either say nothing or give the proverbial “we are investigating” nonsense. That approach has done more harm to this fine profession than any criminal could ever do. Then, just as law enforcement was prepared to take blame without anyone standing up with the facts, a leader stood up. It’s what I call Courageous Leadership not because it’s technical or difficult to do but because it is extremely rare for the leaders in law enforcement to stand up quickly and defend their officers when they are being accused of something they did not do. The Starbucks Executive Chairman Howard Schultz calls the arrest of the men “reprehensible…ashamed…” and “embarrassing.” He is making the media rounds, already met with the two men and plans to close all 8000 stores for a day and provide “unconscious bias training” to every employee. It’s a move that will cost the company millions but he has said that the company intends to “fix” the issue. The dynamics have certainly changed since the leader of the Philadelphia Police Department and Starbucks talked about the incident. Commissioner Ross gave facts and defended his officers while Schultz has given no facts, riddled his comments with emotion and apologies while the Starbucks employee that called the police has left the company. The response to both organizations this week has proven what I often say in the Courageous Leadership Seminar. Leaders must stand up for whatever is right, apologize when a wrong has been done but never do either when it is not appropriate. If your organization is right, you must stand up for that and in the midst of the 24 hour news cycle, it needs to be quick. When the organization is wrong, admitting that and apologizing is also important. Commissioner Ross did this perfectly and for most of the media and the public, the Philadelphia Police Department has been absolved of wrong-doing. This is a lesson that every law enforcement leader needs to take note of. In contrast, Schultz could have easily done the same but weak leaders are exposed in times of crisis and this incident has certainly been that for Starbucks. The truth is, Commissioner Ross is correct. These men were disrespectful and were given plenty of chances to not be arrested. That particular Starbucks has been very consistent in this policy, no matter the race, and even refused a Philadelphia Police Sergeant that wanted to use the bathroom because he was not a paying customer. That sergeant quietly left the establishment. If these two men last Thursday would have acted like men, they would have done the same. 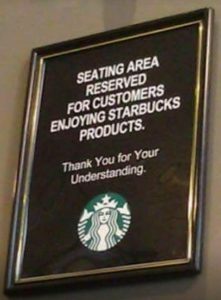 On a personal note, I have purchased many items from establishments so I could have the privilege to occupy their space or use the bathroom. Sometimes I did it out of common decency for the business but other times I was asked to do it and I did it. I’ve also been asked to buy something and I left. Never has it crossed my mind to do what these guys did. Then again, they are being hailed as victims and their actions will cost Starbucks millions in lost revenue and have taken a company with one of the best reputations of inclusiveness to the exact opposite. Claiming racism is nothing to take lightly and certainly there have been instances where African Americans have been treated horrible just because they were black. Law Enforcement, businesses and every citizen must ensure that racism is removed from every aspect of our society and while the cowardly leadership of Starbucks is being praised by some, it only hurts the real issues of discrimination and racism that plagues us. Both of these leaders had a choice. Go with facts or emotions. Stand up for what is right or kneel for a lie. Defend an employee for doing their job or throw one down for doing their job. It is not yet known what the fate of Starbucks or their leadership will be but there is a long history of cowardly leaders ruining the organizations they are over and in my humble opinion, the table has been set at Starbucks and it wasn’t set last Thursday when two men decided to refuse a common sense policy. It was set when the leadership team of Starbucks decided to not lead. The post A Tale Of Two Leaders appeared first on Law Officer.